The president of the United States and the prime minister of Israel each gave major speeches on the Iranian nuclear threat and then they met for a two-hour meeting yesterday, with attendant statements – and yet my column today is on a book that appeared in 1962. 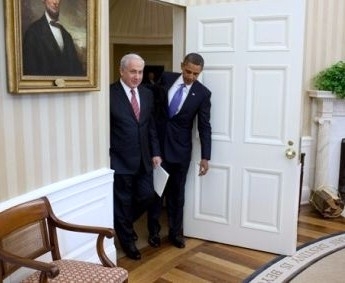 Obama and Netanyahu in the White House. I presume that (1) the Iranian regime, not we the public, is the chief intended audience of the president and prime minister's public remarks and (2) neither leader is being fully candid with the other. Therefore, I am cautious about believing what I hear or drawing conclusions from it. The perception may be, in the words of a Washington Post headline, "Obama assures Netanyahu on efforts to stop Iran's nuclear program" but I am not convinced that is the real story. For example, it might in fact be the possible Israeli use of nuclear weapons to attack the Iranian infrastructure.